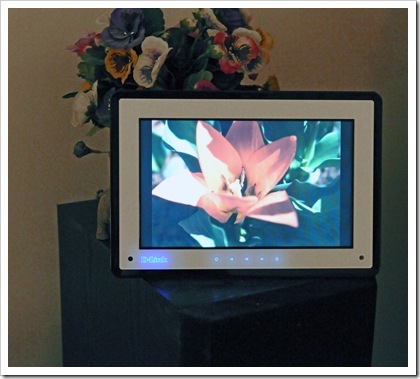 Over the weekend I received a DSM-210 ten inch widescreen format digital frame. While there are a ton of frames available, the only ones I’d consider for personal use must include a bulletproof way to stream content from my network, a way to upload photos to frame memory, and some kind of Internet streaming. 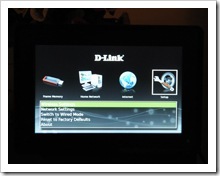 The D-Link frame, part of the Medialounge product family does all the above and more. I’m pretty impressed. Besides handling the wireless streaming (which you’d expect from a wireless picture frame), the DSM-210 is very network savvy. Autosensing my DNS-323 NAS (which sports a UPnPAV media server) the network settings displayed this server as a media source. When I fired up a computer that previously was not used for media sharing, Window Vista detected the DSM-210 and asked if I wanted to set up Windows Media Sharing. Pretty slick. The frame has 1GB internal storage and comes pre-loaded with some sample pictures. D-Link has a widget that works with Yahoo Widgets and lets you manage the content in the built in memory. Delete the samples and drop your own images onto the widget and they are quickly uploaded. In fact, the widget lets you manage multiple frames. I’ve only just begun to explore the Online Content features. You can view photo streams from all the usual places (or set up your own from your hard drive or other RSS capable source). Plus there are channels for just about every interest. And yeah, I’ve got my local weather forecast set up. I can email images to myself (even from a camera phone) and invite friends to email images to me as well at a special address (jpg format). This works pretty much the same as the analogous feature on the Momento frame. If you want to keep your DSM-210 frame in your bedroom, you don’t need to turn it off at night. The frame autosenses motion or light and somehow activates itself when you turn on a light or walk into a room. I’m still investigating this feature to see just how it works. The D-Link logo and some blue LEDs fire up for a bit when you first power on the frame but turn off automatically. Here’s a quick and dirty picture of the frame right after I started a stream from the DNS-323 NAS box. I like this hardware a lot. More to come as I dive deeper into the features.